Donna Karan Fall 2010: A Place Where Dreams Come True! Donna Karan debuted her stunning Fall 2010 collection on February 15, 2010 to a packed house filled with the fashion elite! I was thrilled to be in the audience to see the stunning gowns and of course to see some major celebrity action! I really hope you are ready because I am going to give you a blow by blow of how the whole thing went down as well as discuss the beautiful clothes. AND GO! Above: Brooke Shields getting tons of media love at the Donna Karan Fall 2010 Show. Why it's the lovely and talented Brooke Shields being interviewed and photoged like crazy. I didn't even really have time to soak in the fact that Brooke was there because as I look to the front of me Susan Sarandon is arriving. All I could really think at that point was "Damn it, Janet, I Love you!" The cameras start going crazy again to my right because Demi Moore is sitting right next to Brooke! I have never seen such a media frenzy. Since I was standing on the same side as these ladies, I got all of the camera flashes in my eyes as well. It was intense but you know I stood there and pretended it was all for me! When in Rome! While Demi and Brooke start talking To Extra TV, in walks stylist, Rachel Zoe, BUH-Nanas! I had heard that she was coming via DKNY PR Girl's tweets and that RZ would be filming The Rachel Zoe Project during the show. Sure enough Rachel had her cameras, along with Brad and Rodger. Above: Rachel Zoe arrives at the Donna Karan Fall 2010 Show. At this point I was in heaven and the show had not even started yet. It was almost showtime and the crowd began to part. I then see Grace Coddington, stylist and creative director for American Vogue. I was in awe to be in the same presence as Grace Coddington. She is truly a fashion genius! Then I saw her... ANNA WINTOUR! I am not going to lie, I let out a huge gasp! The girl in front of me turned around and looked at me like I was crazy and I replied "Sorry I just had a moment." Anna totally looked at me for like 5 seconds and it was awesome. Being around the legends of fashion was so inspiring. It was finally showtime and I watched as Anna Wintour put on her iconic sunglasses just as the lights went up! Above: Grace Coddington and Anna Wintour as the Donna Karan Fall 2010 show begins. Rachel Zoe is two people from Anna. Check out those boots! 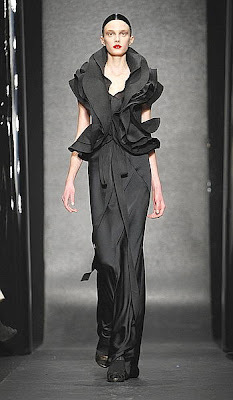 The Donna Karan Fall 2010 collection was amazing. The gowns were great and I totally saw Rachel Zoe taking pictures and eyeing the gowns up and down front to back. She really does work hard and you could tell she was thinking about what client would look good in what dress. Grace Coddington was also taking notes like crazy. It was awesome to see these people at work. Above: If you were a stylist what celeb would you put in this Donna Karan gown? I loved the punch of color in the collection as well. You all know that I am a sucker for color, color, color! After the show was done Anna Wintour bolted up and shot out of the door. She is AW and she can do that! I stayed around to see who I could meet. I had the chance to meet Rachel Zoe and she was "beyond" as she would say. Her cameras were rolling and she took time out from greeting Donna Karan and Joe Zee, creative director at Elle magazine, to take a quick photo with me! Above: Rachel Zoe TOTALLY giving me classic Zoe! Love her so much! She is beyond! I also had the chance to say hello to Brad who I met this past September at Vouge's Fashion's Night Out. Maybe I will be on the upcoming RZP season slash Bravo you really need to give me a show! Above: Jonathan Valdez and Brad Goreski of the Rachel Zoe Project. I Should have asked their camera man to take the pic. Congrats to everyone at Donna Karan for three amazing events during Mercedes Benz Fashion Week Fall/Winter 2010! It was an honor to cover them and I am so happy that some of my dreams came true with DK! Love that gray DK gown. I'd wear it. Other celeb to wear it? Too big for Natalie Portman...I'd say Jennifer Connely. Also, love that blue/turq color!